As we roll into February, it's time to focus on the month's gorgeous birthstone: the amethyst. Today, we're looking at the tiara and jewels from the Norwegian Amethyst Parure. 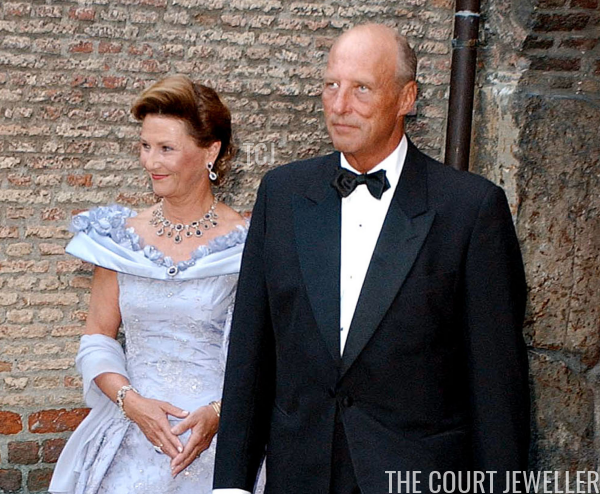 The amethyst and diamond parure was a gift to Queen Sonja from her husband, King Harald V of Norway. The set consists of several pieces: a convertible necklace/tiara, a pair of earrings with removable drops, two bracelets that can be combined and worn together as a second necklace, and a brooch that can also be attached as a part of the bracelet-necklace. 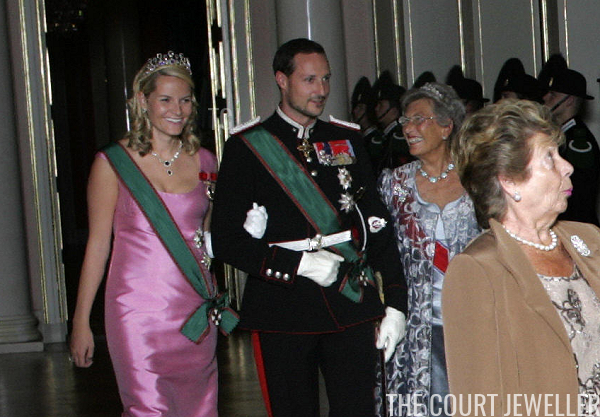 Sonja wore the entire set at the gala held the night before the wedding of her son, Crown Prince Haakon, in 2001. She pinned the brooch to the center of her gown's neckline, and she stacked both bracelets on her right arm. For years, the queen was the primary wearer of this piece, sporting it as both a necklace and a tiara. 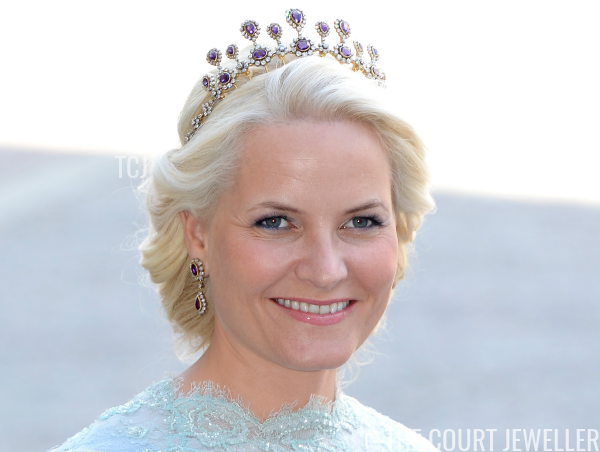 In recent years, however, she appears to have either given or permanently loaned the parure to her daughter-in-law, Crown Princess Mette-Marit. (There’s some speculation that it might have a gift in celebration of the birth of Mette-Marit’s daughter and the heir to the throne, Princess Ingrid Alexandra.) Above, Mette-Marit makes an early appearance in the tiara at a state dinner in Oslo for the Italian President in September 2004. 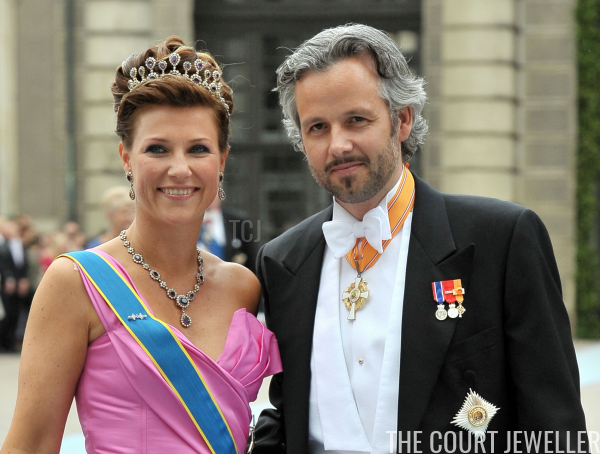 The crown princess generally wears the piece as a tiara, not as a necklace. Above, she wears the tiara for an important state visit to London in October 2005. (The British and Norwegian royals are close cousins; King Harald's father, Olav, was the son of a British princess, and he was born on the Sandringham estate.) 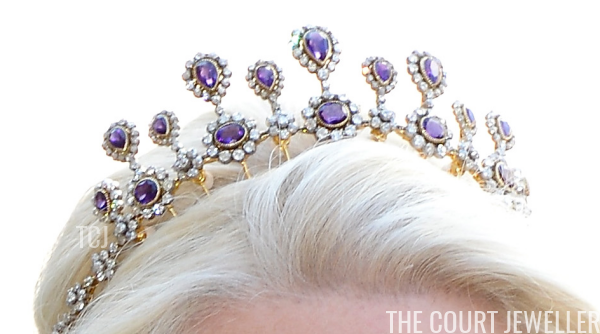 Mette-Marit selected the amethyst tiara for the grand state banquet at Buckingham Palace. 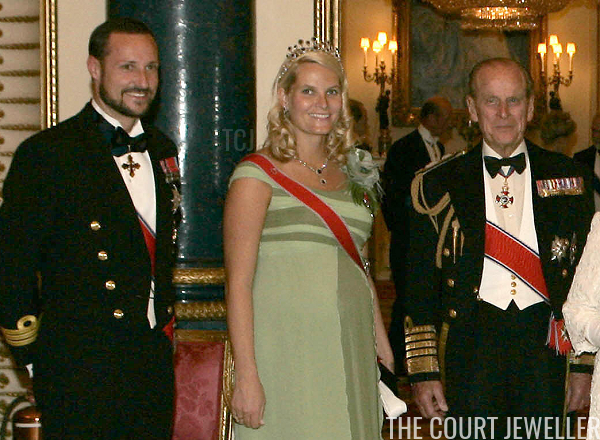 Mette-Marit also chose the tiara for the Diamond Jubilee festivities for the late King of Thailand in June 2006. But her highest-profile outing in the amethysts to date was probably the grand royal wedding of Princess Madeleine of Sweden in June 2013. 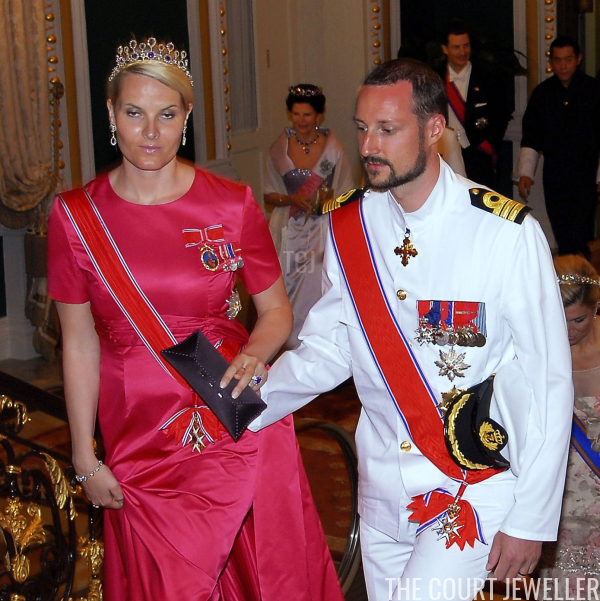 Mette-Marit is the most frequent wearer of the amethyst set, but other Norwegian royals also have access to the jewels. Princess Märtha Louise donned the amethyst parure, including the tiara and the bracelet-necklace, at the 2010 wedding of Crown Princess Victoria of Sweden. While Mette-Marit features sleek hairstyles, Märtha Louise backed this tall necklace tiara with an impressive hairstyle, providing the amethysts with a substantial brunette backdrop. For me, this was probably the most successful outing of the set to date.